A PREVIEWS Exclusive! 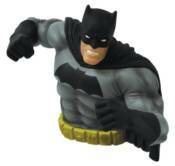 Frank Miller's powerful depiction of Batman from his seminal graphic novel Batman: The Dark Knight Returns is sculpted for this new bust bank from Monogram! Made of vinyl, the bank stands roughly 6' tall and approximately 9' wide. This piece can serve as a decoration in your office or home, or you can use it to store your loose change! Available only through PREVIEWS and your local comic shop, this bank is offered in two colors - a Blue costume or a Black costume.